Residential and light commercial use. Now available online! Many homeowners with poured-in-place concrete foundations will find cracks in their basement walls on closer inspection. Cracks are created by drying shrinkage, thermal movement, and other causes. If minor, they will cause no immediate problems. But over time, minor cracks often grow larger and cause major headaches, including reduced structural integrity or water leakage. of epoxy or polyurethane foam repair materials. 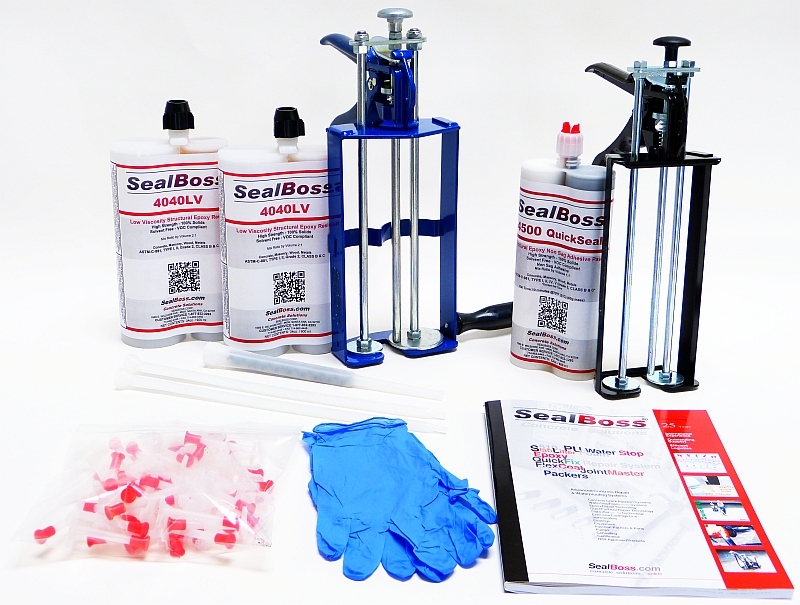 SealBoss now offers Do It Yourself Kits for basement repair contractors and the handy homeowner. Single component pumps include inexpensive hand held devices, hand pumps and electric pumps. Multi ratio devices can be manual, electric and pneumatic. Some PU injection pumps can be used for epoxy injection (with limitations). SealBoss supplies PU as small as 1 gal units. We do not supply PU in cartridges for the following reasons: 1. Reduced shelf life in cartridge due to high moisture sensitivity, 2. Limited Injection pressure. For small jobs we recommend the SealBoss (3000psi) handgun and a 1 gallon unit. Final Remarks: Injection Technology has become more refined and in cases more confusing. Modern products are very capable, but similar characteristics are not easily distinguished by the untrained person. To avoid costly failures caused by product/job mismatches, SealBoss provides thorough technical support to make your job a good one. Please make use of our services - we are just a phone call away. - Two component equipment for most epoxy resins for ease of use and precise mixing.